The Council on American-Islamic Relation (CAIR) recently released the report: “Legislating Fear: Islamophobia and its Impact in the United States.” The list of organizations “whose work regularly demonstrates or supports Islamophobic themes” is rather large. Fox News, National Review, The Washington Times and Mark Levin can all take a bow — you’ve made the list! CBS and The Associated Press were not invited to the party, but perhaps that’s because their reporters cover break-ins at a water treatment plants by guys like ‘Asef Mohamed’ as if the suspects were curious kids with an unquenchable thirst for exploration. 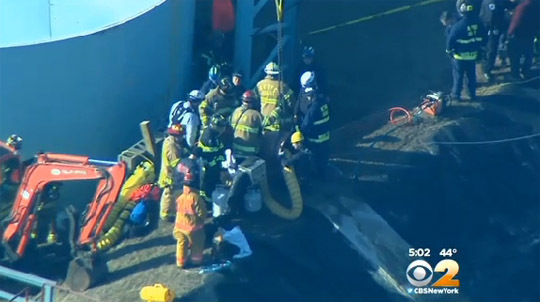 MANALAPAN, N.J. (CBSNewYork/AP) – Rescuers have freed a man who had been stuck for hours in a pipe at a water treatment plant in New Jersey. Officials told CBS 2 around 11:30 a.m. that 26-year-old Asef Mohamed, of Manalapan, had been freed and airlifted to an area hospital. He was 10 to 12 feet down the pipe, which was not in use, WCBS 880′s Levon Putney reported. United Water spokesman Rich Henning said Mohamed broke into the plant that treats and pumps water for the township of Manalapan. Workers heard cries for help coming from the pipe around 7 a.m. Friday. “This was a person that purposely climbed a six-foot fence with three or four layers of barbed wire on top,” Henning said. Manalapan’s mayor told CBS 2 the town is considering the possibility of having Mohamed pay for the cost of the rescue operation. To recap: Asef Mohamed scaled a six-foot fence with three or four layers of barbed wire in order to break into a water treatment plant. He climbed down 10-13 feet of pipe, got stuck, needed to be rescued and officials who are “considering the possibility” of having Mr. Mohamed pay for the rescue have “no idea” why he did it. That is the kind of passive reporting that will get you left off the list of “Islamophobic” organizations in CAIR reports. If more of our state and local officials would just claim they have “no idea” why guys like Mohamed are scaling barbed-wire fences to get into water treatment plants we’d all be better off. If reporters who were present for the “no idea” pronouncements responded with zero follow-up questions, we’d all be better off. Previous Entry ‘White Privilege’ artist: Does it exist, or do I simply lack critical thinking skills? LOL. CAIR is a joke. They’re one of those organizations that sees “Islamophobia” in everything. Like “racism” and “homophobia,” it’s one of those lazy insults that’s lost all meaning because of how often they’re used. Apparently if you speak out against terrorism, you’re “Islamophobic” in CAIR’s book. And is it just me, or isn’t CAIR’s list basically McCarthyism, this time coming from leftists? Speaking of, isn’t Hollywood’s refusal to portray the faithful in a fair light and as anything other than the Westboro Baptist stereotype sort of like Hollywood’s self imposed Hayes Code? If Osama Bin Laden had been arrested in 2002 for carrying an AK-47 while boarding a commercial airliner, CAIR would have whined about “Islamophobia.” And leftists like to portray themselves as victims of persecution. (Sean Penn’s greatest disappointment in life is that he has never been able to get the IRS or NSA or FBI to spy on him or prosecute him during Republican administrations. ) But it is the Left that now constantly uses tactics (including lazy insults) right out of the McCarthy-era witch hunts. Hey Tom, WHY do you think they’re Witch Hunts? The Hollywood 10 was dirty and McCarthy wasn’t even a member of HUAC since he was a Senator. I agree with you, Emmanuel. Practically every single blacklisted Hollywood star were indeed communists and many of them hated America with a passion. A few even spoke glowingly of the Soviet Union. I can agree with that, too. The modern left has more in common with McCarthyism than the right does. CAIR’s list of “Islamophobic” organizations reeks of McCarthyism-like tactics.